The Holy Spirit resides within Jesus Christ’s true followers after Jesus rose from the dead and ascended to heaven (Acts 2). The Holy Spirit is not a vague shadow, nor an impersonal force. He is equal in every way with God the Father and God the Son. He is considered to be the third member of the Godhead. A primary role of the Holy Spirit is that He bears “witness” of Jesus Christ (John 15:26, 16:14). He tells people’s hearts about the truth of Jesus Christ. The Holy Spirit also acts as a Christian’s teacher (1Cor. 2:9-14). He reveals God’s will and God’s truth to a Christian. A word about the gifts of the Holy Spirit and tongues: When the Holy Spirit came upon Jesus at his baptism we see him descending as a dove (Matthew 3), we can not limit the power of the Holy Spirit by saying tongues are the only outward sign of the spirit. Yet, I knew a Lutheran missionary who spoke to people in Japan in their native tongue and he had not yet learned the language. 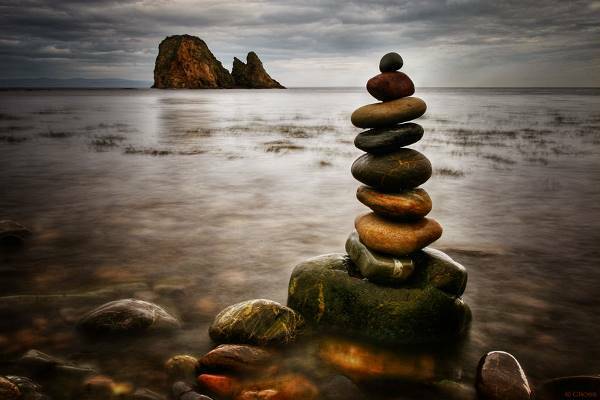 The spirit moves as the spirit moves, often in ways we can not explain or understand. We must choose not limit or judge the Holy Spirit in any way, just as we must choose not limit or judge the movement of the Father or the Son. Receiving the Holy Spirit – Having a personal relationship with Jesus as your Lord and Savior is key as well as a teachable spirit, for it is your willingness to yield to God, just as with salvation, which will influences the degree of his functioning in your life. Unrepentant sin will hinder the move of the Holy Spirit. To have the Holy Spirit living and active in your life is to have a repentant heart and a living hunger and thirst for a deeper presence of God. Here is a prayer I have composed for those who might want to pray for a greater in filling of the Holy Spirit. Just as Jesus told his disciples to wait for the Holy Spirit, your promised gift, so I have waited for this gift. I know the Holy Spirit came on the day of Pentecost and suddenly a sound like the blowing of a violent wind came from heaven and filled the whole house. Father I do not tie your hands, for to Christ the Holy Spirit came as a dove while to the disciplines he came as an igniting fire. And so as a follower of Christ and in his name I ask for you to send the Holy Spirit, stirring my body, my soul and my spirit, to fill your holy vessel now. I open myself to receive the Holy Spirit and I thank you for expanding your presence in me to ignite a passion which will change my world! Now allow yourself to experience all the Lord has for you, if you feel stirred to speak this prayer again, do it, follow the spirit’s leading that you might be filled and flooded with his holy presence. My prayer for you is to have the richness of his divine presence in your life today. I am posting a link to a song to encourage and inspire you! This was our prayer for the 2012 Wilderness Retreat! If you are a Christian, and even if you aren’t currently you might be wondering how to live a righteous life, Psalms 15 gives us insight. PS 15:1 LORD, who may dwell in your sanctuary? Who may live on your holy hill? PS 15:2 He whose walk is blameless and who does what is righteous, who speaks the truth from his heart. Pray for a blameless life, speaking truth from the heart. Ask forgiveness where you have used a slanderous tongue, done your neighbors wrong or cast slurs on your fellowman. Pray to have a life of integrity, resisting the vileness around you, honoring those who fear the Lord and willingness to keep your word even when it hurts. PS 15:5 who lends his money without usury and does not accept a bribe against the innocent. Lord help me to give to others without expecting anything in return and help me not do anything to harm anyone, especially an innocent person. Father, give me faith in you that will never be shaken! “Every good gift and every perfect gift is from above, coming down from the Father of lights, with whom can be no variation, neither shadow that is cast in turning.” (Jas. 1:17, ASV). Faith’s blessing has existed from the days of Adam and Eve. When we release a forever blessing, it goes into eternity, going beyond today through every tomorrow and into forever. It is with our words that we release blessings. Blessings come from deep within us as we release the solemn will of God, while curses which can also come from deep within us, release the deceptive will of the devil. Where are forever blessings found? They begin in a stirring by God in your heart and are often rooted in scripture. This list of four is just a beginning. Forever blessings can be found in many places of the bible; a great place to start is with the promises of God. So check out your favorite list. Allow God to reveal the forever blessings he desires to release in and through you today! I have been asked to craft a prayer for a Portland Police Officer and after finishing it I realized there are other officers who might find comfort and strength from this set of prayers as well, so please use or share them with the Police Officers you know, inserting your city, county or state in place of Portland. I take the sword of the spirit and cut off all forms of discouragement, doubt, and fear I feel as I prepare for my shift. Knowing I may be confronted by all forms of sin, so I take up the shield of faith as I suit up for the day, placing the helmet of salvation upon my head to bring my thoughts and actions in line with Christ as protect the people of (Portland). I place upon my feet the gospel of peace, trusting in Christ to empower and protect me so I can act responsibly and with integrity in every situation; in Christ name I pray, Amen. I cut off all forms of discouragement, doubt, and fear I felt or encountered during my shift. I take the blood of Jesus to wash away all sin which I dealt with including the shedding of blood, violence, neglect and abuse. I take the cross of Christ and place to between me and the streets of (Portland), knowing God will provide all (Portland’s) needs according to His riches in glory. I end my shift knowing God is the ultimate power and authority in my life, and over the (city of Portland) in Jesus name I pray, Amen. This is a 31 Day prayer Guide for Oregon using the Seven Mountains or prayer focus of Family, Church, Education, Media, Arts & Entertainment, Business and Government for each day of the week as well as having a weekly theme, Holiness, Faith, Hope, Love and Joy out of which rise the daily scripture included in each day. 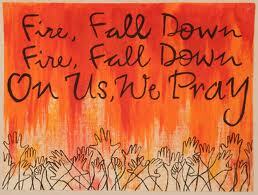 As we prepare our heart and minds to come into union we begin by focusing on God! Lord, we praise you for the businesses here in Oregon. Please help each business in Oregon to realize who you are, allowing you to lead, direct and guide them. Reveal yourself to those who work and patronize the businesses of Oregon. Pray for local business and for the counties of: Jackson, Josephine, Douglas, Curry, Coos as God leads you. 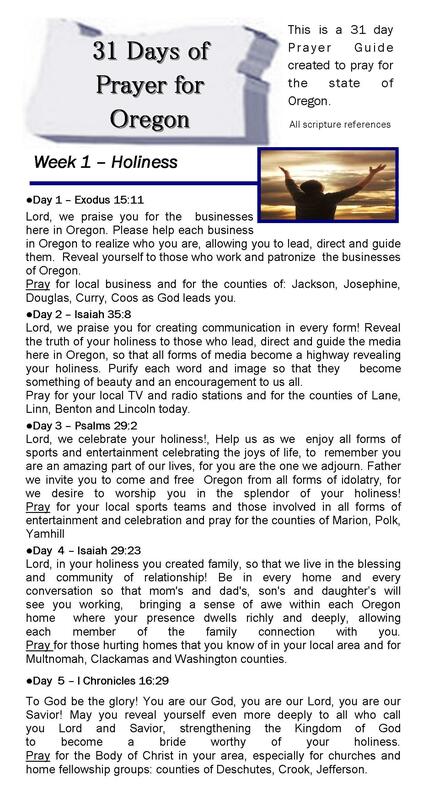 This brochure 31 Days of Prayer for Oregon is now available by sending $2 with your address to:Complete Joy PO Box 33774Portland, Oregon 97292-3774. If you would like multiple copies please contact Complete Joy for more information on discount pricing at my.completejoy@gmail.com . Thanks a ton for being our teacher on this subject. We enjoyed your article a lot and most of all cherished how you really handled the areas I regarded as being controversial. You’re always quite kind towards readers really like me and let me in my lifestyle. Thank you.